← Changes in latitudes – changes in attitudes. It was a little look back, courtesy of Facebook. I thought I’d share the experience with you for “Wayback Whensday”. For some reason I’ve been feeling rather nostalgic the last few weeks. Perhaps this nostalgia kick began when I sent a link to a group of high school chums. Though we’ve not physically gathered together in over four decades, we’ve often reconnected through Facebook for an impromptu chat about “back in the day” … mostly we dwell on the good stuff – gossiping about former teachers or classmates. It is harmless enough banter, and it feels like we just continued a conversation we might have been having in the high school cafeteria, except amongst the six of us, we are spread out all over the U.S.
Well, I sent “the girls” a local news video of the old Park Theatre, the only movie theatre in town, and a place where all of us hung out at one time or another in our youth. For a buck we could see a double feature, the upcoming attractions, munch some popcorn and probably still had enough $$ left over to stop while walking home and have a White Castle slider and a pop. Such a deal. The Park Theatre’s biggest claim to fame was that Bob Seger played there when he first hit the music scene. But, through the years, the Park Theatre fell on hard times, became an adult theatre in the early 70s, then part of it was razed last year to make lofts. The lofts opened on January 15th, thus I sent the local news video and us six soon had a lively chat session about the good ol’ days. As you know, there are sites all over Facebook where one can reconnect and reminisce about your school days, good times (or not) and our high school and middle schools are among those sites. My nostalgic kick continued when I was thinking about the Italian family and their young daughter who lived next door to us back in Oakville, Ontario. They spoke very little English. On a whim, the other day I searched for that sweet little girl with the saucy sausage curls – Gracie Ann. I discovered she uses her maiden name and now lives in Italy. I noted she had several Facebook groups she belonged to – the City of Oakville, and the schools she had attended … one was the same elementary school as me. I attended E.A. Orr Public School from the time I started kindergarten until my father was transferred with Ford of Oakville to Ford of Woodhaven in the Summer of 1966. On the last day of school at E.A. Orr I bade my classmates a tearful farewell and knew I’d never see them again. I was crushed – not only to leave my classmates and playmates, but to go to a new and different country where we had no family and to start anew. By late September, school – that place of learning where I had excelled, and, along with many of my classmates, was double-promoted from Grade 2 to 4, seemed like such a distant memory as school was no longer a place I desired to be. I was bullied relentlessly in sixth grade for my Canadian accent and pronunciation of words – by my peers and even my teacher who ridiculed me. For kicks, on Monday night I started meandering through a Facebook “group site” about E.A. Orr, my elementary school. Most group sites must grant you permission to access and view comments and pictures – but it was not so with this site. Within minutes I was fully immersed in the chatter between 167 former E.A. Orr attendees and I began perusing photos of individuals and classes from as far back as the early 60s. I discovered the school became a senior citizen residence in 1987. I then stumbled upon some comments by a woman by the name of Maggie Rust. While her name didn’t ring a bell, she had commented on her kindergarten teacher and what year she had started school – well, bingo … it was the same as me. But I could find no photos of Maggie or her classmates. I searched through the entire site, reading Maggie’s comments … and decided to reach out to her on her own Facebook page. I sent her a picture of me in September 1961 on my first day of kindergarten with the message “Hey, this was me and I’m wondering if we knew one another?” … a few minutes later Maggie responded. Well we got lost in time in a flurry of e-mails back-and-forth over the course of a few hours – catching up a bit, talking about school and the old neighborhood, though sadly my recollections were a little tarnished. I was disappointed in myself, since I could not recall alot of names of classmates, teachers, or even the streets that I probably encountered on an everyday basis for those five elementary school years, yet Maggie remembered every detail. She told me she has “friended” many of her former classmates so I attributed her great memory to this fact as well. Today Maggie sent me the picture above. 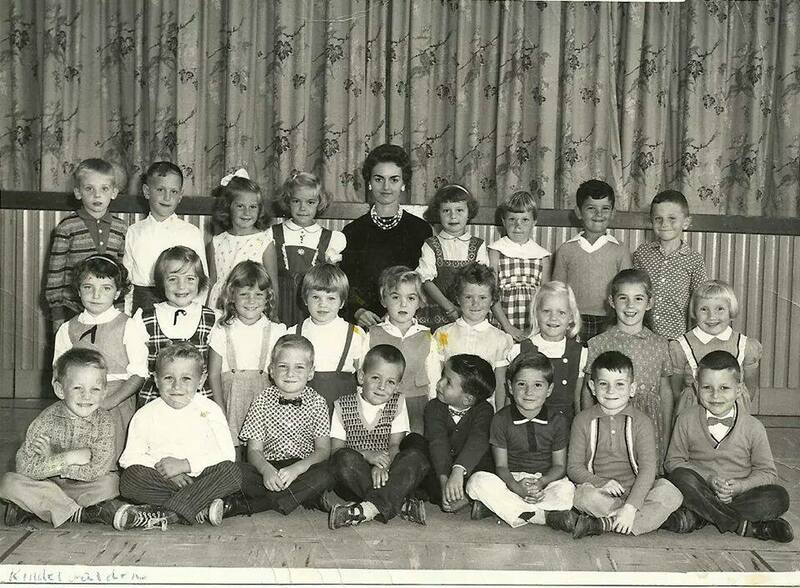 She simply said “our kindergarten picture – I’m positive you are beside me … I’m second row 3rd from the left; you are 2nd from the left?” Sure enough – there we were … some 54 years ago. Pretty little Margaret with her flowing hair and her big smile and I remembered her right away, just like it was yesterday. I hurriedly enlarged the picture and cut-and-pasted it into a Word document, and, as my eyes darted from left to right, I was able to recall over half of those kids – some, even their last names. There we were … seated with Mrs. Kellett, all wide-eyed and innocent, and for some of us the first time we’d ever been away from our parents – it was a whole new world. Were we chatterboxes back then Maggie, like we were the other night? What did we little girls talk about way back then? Probably teddy bears and dollies, maybe our pets and penmanship. I remember along the front of the classroom was a line of letters “A” through “Z” and oh, how our teacher had us strive to make our letters hit both lines in our scribblers. We practiced cursive while we gripped our thick, number 2 pencils and tried to steer that pencil up and down and glide it along the paper to connect the letters. We needed to have perfect penmanship and receive that coveted “A” or “good” or “nice work” from Mrs. Kellett. Thanks for taking me along for the ride on the wayback machine Maggie – it’s been a brief respite back to another era, when life was simple and sweet. I am so glad you found her. I am sure you will have many more visits with her. Isn’t it amazing how far back are memories can go? It is Marge – we actually thought we were in Grade 5 together as well – we both had same teacher for Grade 5 in 1966, but then realized later that she was there for 1966-1967 and I was there for 1965-1966 (end of June) … Maggie moved away from Oakville part of the time during her elementary school years and I was double-promoted so skipped Grade 3. It was something – I remembered her right away – 54 years later. The funny thing about last week, Linda, was that I had asked friends to send me contact details because I was deleting my Facebook account. I was tired of all the mundane posts from people about the silly clothes they put on their pets, the food they cooked, photographed & planned on eating, and all the other tedious nonsense that Facebook is famous for. I figured that closing that chapter would be good. Then I got your message…It was so much fun to trace back to the very moment that you and I stood side by side, having our five year old faces photographed, forever to cherish. There you were, standing right beside me. I remember the early days of kindergarten and the feeling of loss it gave me. I didn’t want to be in school. I wanted to be at home with my mom. My older brothers and sister were all at school but that wasn’t where I wanted to be. I went to that school for all my grades…including one in northern Ontario for less than a year. I grew up and moved away from Oakville a year after my eldest daughter was born in 1982.